Don't let summer break get boring. Change it up by celebrating each and every special day. Did you know July is the National month for Blueberries, Hot Dogs, and Ice Cream? It is also National Anti-Boredom Month. Who could get bored in July? Idk, it gets pretty hot here in Indiana. So, a lot of kids probably stay inside and play video games Minecraft. 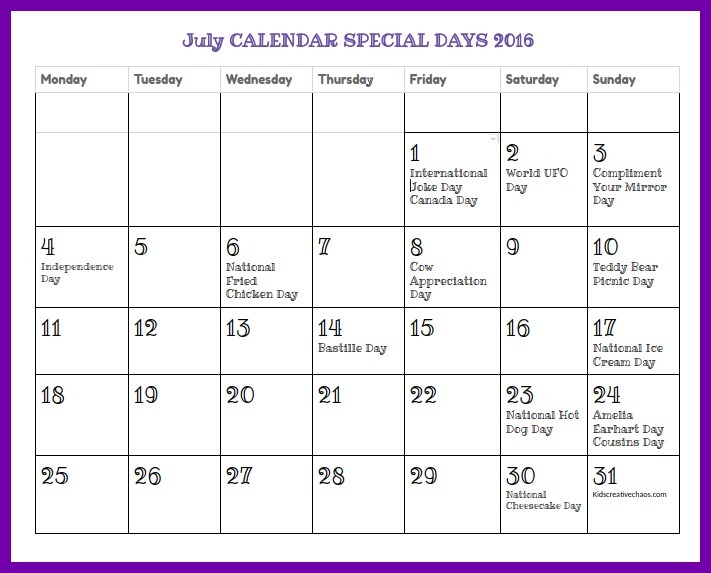 Check back here each year for an updated version of our free printable July calendar of special days and holidays. Enjoy! 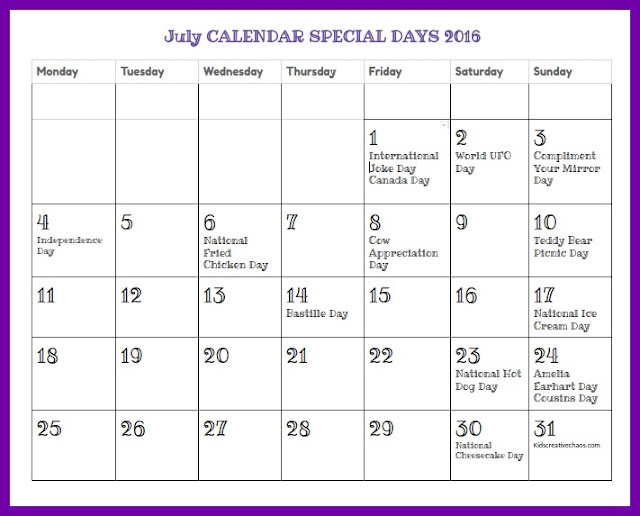 Plan lots of Fun Activities with this July Calendar of Special Days and Holidays 2016. 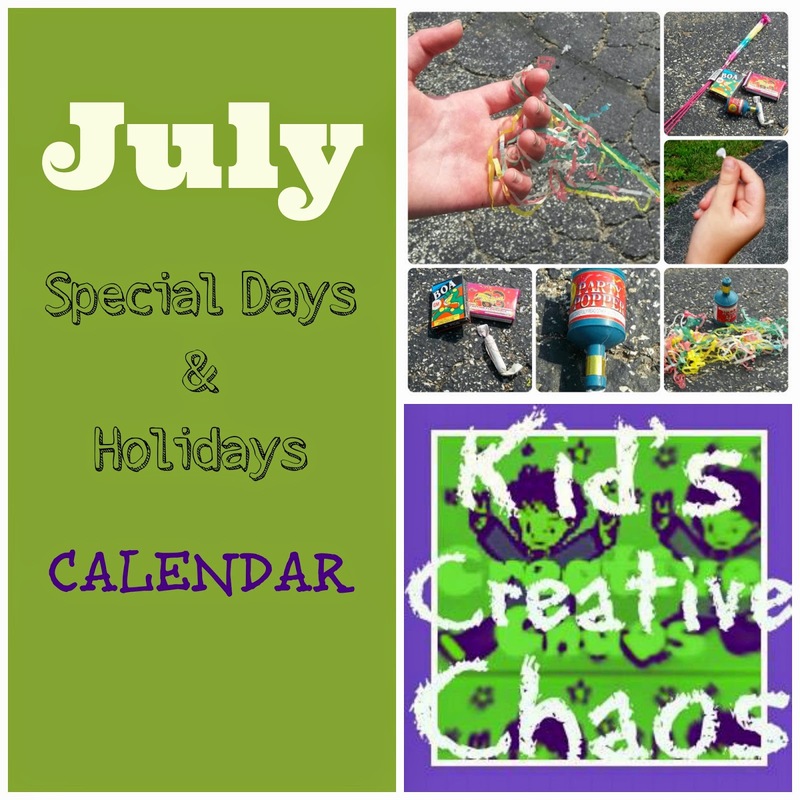 Free printable July Calendar for Classroom. This 2016 July calendar of holidays is a Google Doc. Print it out as is or make changes as you see fit. Each year, we edit the calendar to make sure the dates are accurate. Some holiday dates change each year. 1 International Joke Day. Whether you say Ha-ha, lol, or lolz, tell a joke to get a belly laugh out of a friend today. 1 CANADA Day. Here are some activities for Canada Day. 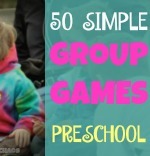 I also rounded up some posts from the Kid Blogger Network. Oh my, my favorite, is this post on Canadian Peg Dolls. 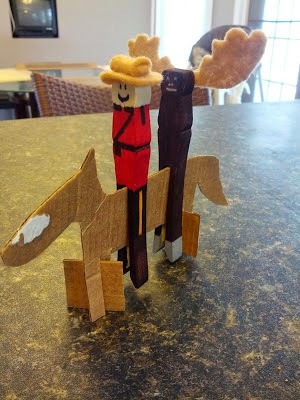 Canadian Mounted Police Peg Dolls from Clothespins by East Coast Mommy. 2 World UFO Day. Roswell July 2, 1947. 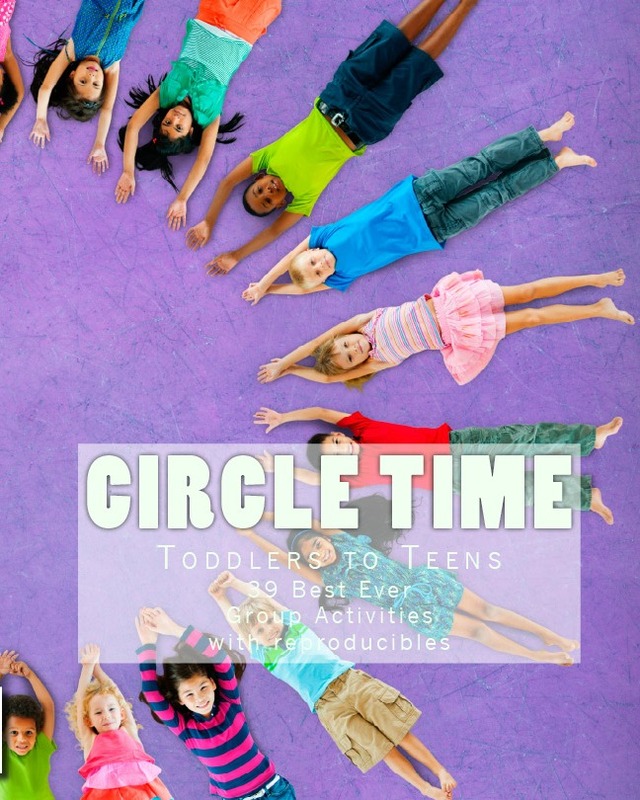 No aliens here, perhaps these futuristic activities for kids will help you celebrate. 3 Compliment your Mirror Day. I don't know about this day. Shouldn't this be everyday? Anyway, maybe let the kiddos choose what they want to wear today- no matter what it is? You can do it, Mom. Build self-esteem with self-expression. 4 Independence Day. Here are some Firework Safety Tips and Fourth of July Activities from Pinterest. 6 National Fried Chicken Day. 10 Teddy Bear Picnic Day. Celebrate today with teddy bear activities. Maybe your teddy bear would like a purse or a hat or a cookie? 14 Bastille Day (French National Day). What is Bastille Day? I got nothin' except this post on how to make French Toast. So, eat some while you read up on this French holiday. 15 Cow Appreciation Day! From our friends at Chick-Fil-A. How about celebrating with a cow coloring sheet? 20 National Ice Cream Day (Third Sunday) Ice cream is awesome on a hot July day, even better, Ice Cream Snowmen. 23 National Hot Dog Day. Only in America, right? 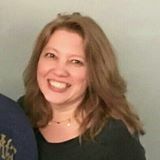 Angie has a yummy recipe for Chicago-style Hot Dog Pizza Bites. 24 Ameila Earhart Day. So... I've got a groundhog flying an airplane coloring page. It can be your catalyst for a discussion on the history of Ameila Earhart. 30 National Cheesecake Day. Hooray for Cheesecake!